For the serious archaeologist (and historian) examining the excavations of Ste. Marie I, the contributions of numerous persons need to be considered. Chazelle SJ, Martin SJ, Hallen, Kidd, Jury, Hunter, Gray and Tummon, and most recently Triggs, (apologies to those whom I have not mentioned, both living and dead) have all contributed to varying degrees in our understanding of this seventeenth wilderness mission headquarters of the Society of Jesus among the Hurons. In this author’s opinion, it is the work of Fr. Denis A. Hegarty, a Jesuit who excavated in the mid- twentieth century, that gives us the most accurate understanding of this mission outpost. In 1948, Fr. Denis A. Hegarty SJ arrived at Martyrs’ Shrine. His ministry at the Shrine was primarily pastoral, however, he was named Curator of Museums by the Director of the Shrine, Fr. T. Lally SJ and Jesuit in Charge of Excavations at St. Marie I. His first responsibility at Ste. Marie was drawing maps for Wilfred Jury. From 1948 to 1951, Fr. Hegarty worked closely with Wilfred Jury. Fr. Hegarty continued excavations and in 1954, he discovered the grave of St. Jean de Brebeuf. After this discovery, he continued excavating in the area up until 1962, alternating between Ste. Marie I and St. Ignace II. What makes Fr. Hegarty’s understanding of Ste. Marie I most plausible are three consideration. First is the fact that he was a Catholic and a Jesuit. His understanding of Catholic and Jesuit traditions with regards to liturgical practises and daily life gives credence to the features and artefacts found at Ste. Marie I. Second, his methodical approach to the evidence assists greatly in identifying which foundations belonged to the seventeenth mission village and those that belonged to another period. Finally, by working with Wilfred Jury during the 1948- 1951 seasons, Fr. Hegarty’s work identifies authentic findings from those that were added for a variety of reasons during the reconstruction of Ste. Marie I from 1964- 1968. The information that follows for this article is gathered from Fr. Hegarty’s archaeological slides, his memoirs and various correspondences, his unpublished but bound book, “This Band of Brothers”, and personal conversations with the author in 1995, all of which are preserved at Martyrs’ Shrine archives. The map created and labelled by this author summarizes Fr. Hegarty’s findings. With regard to Fr. Hegarty’s understanding of Catholic liturgical life, we are first concerned with the location and function of the Church and chapels. In the seventeenth century, it was common practise for the altars to face east. As well, it was the duty of every priest to celebrate a daily Mass. Con-celebration was not practised in the seventeenth century, so Ste. Marie would have to accommodate at times, upward to about twenty- two priests! 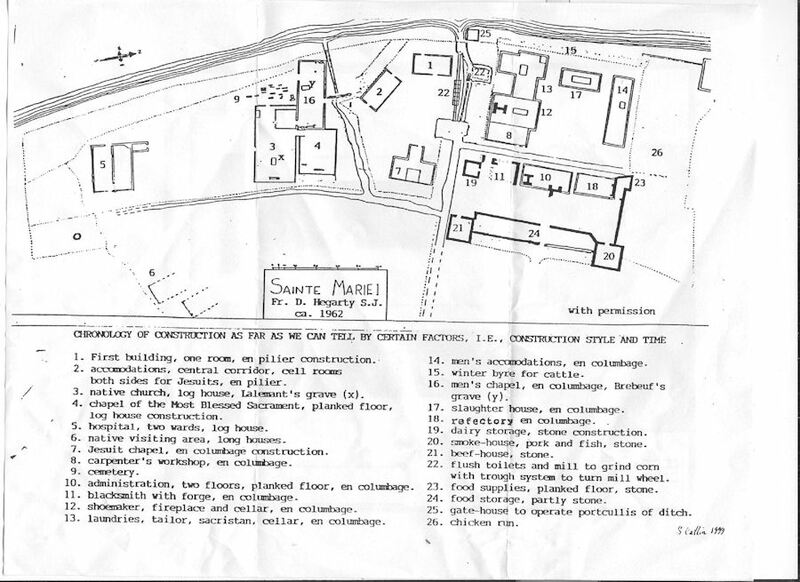 Thus, the Church complex identified by buildings 3, 4, and 16 satisfy these requirements, all facing east and with four altars (also, in building 3, an empty grave feature was discovered in 1962 and identified by Fr. Hegarty as St. Gabriel Lalemant’s, before his exhumation and re-internment with St. Brebeuf at the rear of building 16). With regard to identifying the authenticity of features at Ste. Marie I, Fr. Hegarty logically employed three criteria. First, the style of each building should follow seventeenth century building practises. This would include, en pilier, en columbage, and log house (see building 3). Second, there should be evidence of fire damage to the foundations found, since Ste. Marie was destroyed by fire [this would leave out the reconstructed longhouses, which were of an earlier era according to Fr. Hegarty, and the five sided bastion reconstructed at the south end of the mission, which was probably a lookout for the XYZ Lumber Company of the 19th century (This was further verified in Gray and Tummons report)]. Finally, most of the foundations found at Ste. Marie follow a consistent measurement of being a multiple of eleven inches. Thus the reconstructed “granary” is an unlikely structure associated with Ste. Marie I (of interest, the building was destroyed by fire, however, according to local stories told to Fr. Hegarty, the building was actually Mr. Playair’s hunting lodge and “accidentally” caught on fire). Finally, with reference to the reconstruction of Ste. Marie and authentic excavation, one can first examine the waterway system in general (i.e. the location of ditches for water supply and drainage) and the lock system in particular. The largest artefacts found at Ste. Marie I were several hewed out logs located at the end of the central waterway system. The “mill at Ste. Marie I” theory was published as part of a Master’s thesis by William Russell SJ, who worked during the summer months with Fr. Hegarty in the late 1950’s. Other than the drainage ditches/waterway system, one can also examine the location of the palisade walls- one set of which does not appear on Fr. Hegarty’s map. It is located near the south eastern portion of the site, dividing the mission into an area referred to as “The non- Christian area” in tourist brochures of the past (test trenches were dug by Gray and Tummon to see if there were any palisades in this area but the finding were inconclusive because of site contamination). Other findings relating to the ditches and palisades are those located in the most south eastern part of the site, an area where Fr. 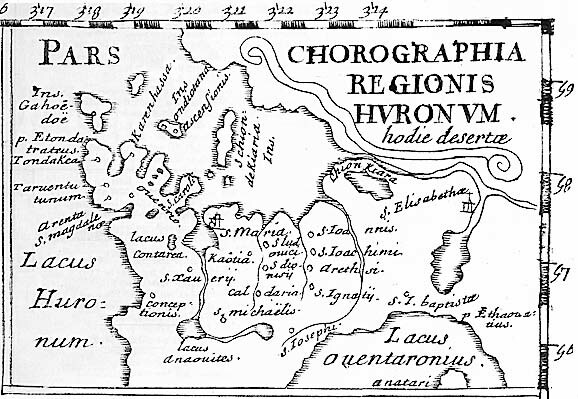 Hegarty found evidence of longhouses (see number 6 on the map). The reader is encouraged to examine the map provided since this article is only a brief overview of Fr. Hegarty’s work. His map includes the findings of both Kidd and Jury, as well as his own. The numbering system was created by the author to indicate the chronological order in which buildings were constructed at Ste. Marie I according to Fr. Hegarty’s deductions. The reader is directed to note the location of the fireplaces, palisades, ditches and waterway system, as well as the location of longhouses. Buildings such as the reconstructed five sided bastion, the granary, and the longhouses within the palisade walls are of different historical periods, according to Fr. Hegarty. 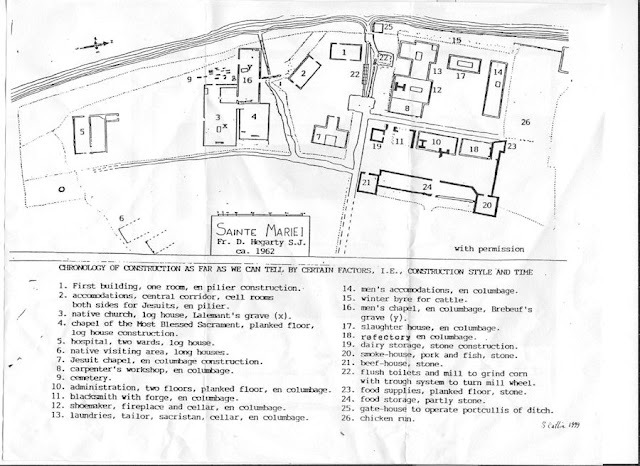 The descriptions of each building accompanying the map are of special interest. Finally, the archaeological slides of Fr. Hegarty have been examined by some archaeologists and are available for viewing at the Martyrs’ Shrine archives, along with other selected reports and correspondence. Of course Fr. Hegarty’s work is open to criticism, especially with the development of new archaeological methods and as new primary historical resources come to light, however, his discovery of St. Brebeuf’s grave can never be disputed nor his commitment to deductive reasoning, historical scholarship (especially regarding the liturgical practises of the Roman Catholic Latin rite Church and the information provided by the Relations), and the scientific method, particularly those of archaeology that was being utilized in mid= twentieth century Ontario.